“The Eucharist calls for a third world war against poverty . 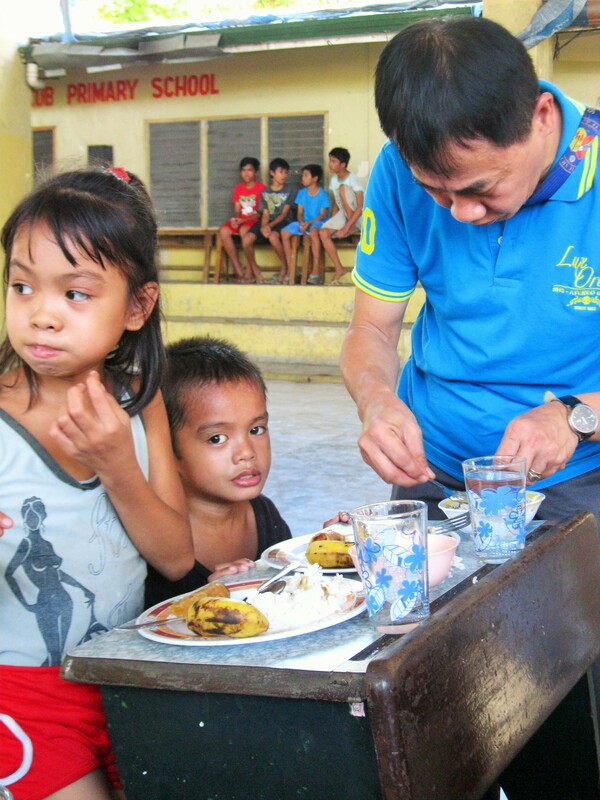 . . against cruelty (where) poor children scramble for scraps from the table.” This was the message of Cardinal Charles Bo of Myanmar who was the Pope’s representative for the 51st International Eucharistic Congress (IEC). In response to this challenge, the Grade School and High School teachers of Sacred Heart School-Ateneo de Cebu went to The Blue Plate kitchen on January 22 and 26 respectively for a solidarity meal with the pupils of Cubacub Elementary School. The activity was organized by the Social Involvement Office as a gesture of unity with the Universal Church in its celebration of the IEC which was held in Cebu from January 24 to 31. The idea of inviting teachers to The Blue Plate kitchen through a solidarity meal was inspired by the Archdiocese of Cebu’s Solidarity Commission which organized a one-day feeding for street children as part of the celebration of the IEC. “We saw the opportunity to integrate the celebration of the Eucharistic Congress to our feeding program in Cubacub Elementary School” said Mr. Rhoderick Abellanosa, social involvement coordinator. The teachers assisted in the preparation and distribution of lunch to 78 pupils in Cubacub Elementary School, which has been the primary beneficiary of The Blue Plate Project since August 24, 2015. They also taught the students the theme song of the IEC, Christ in Us, Our Hope of Glory (Colossians 1:27) which was sang, with action, before the blessing of the meal. After the solidarity meal, one of the participants shared that she “found the activity as a concrete opportunity to understand Christ’s self-giving through the Eucharist.” The breaking of the bread also means “giving oneself to others through service” she added. The Blue Plate Project is now on its fifth month of operation. It targets 160 days of free mid-day meal. It is under the supervision of SHS-Ateneo de Cebu through the Social Involvement Office (RJS Abellanosa).